The game was all of four innings old and you could feel the collective butterflies flittering within the young player’s bellies in this the first game of their inaugural season. There were high expectations on this neophyte troupe yet here they were on the wrong side of a 9-8 deficit against the home team Blue Devils of Westfield. "Strike Two." The umpire's command rumbled through Echo Lake Park. Young Danny B. raised his right hand requesting time. The third-grader inhaled deeply and smacked at his spikes with his bat barrel releasing chunks of caked earth to the ground. The boy gazed down at third base where Coach Mike was moving his fingers from his nose tip to right earlobe and back again in some telling sequence. "Come on, Danny boy. Protect that plate, Bud," the coach begged clapping his hands in encouragement. It was a Saturday afternoon in early September. The air was thick and hot. Summer had not yet relinquished its hold on the weather. "You can do this, Pal," Danny’s father cried from his perch atop the bleachers. He winked in his wife’s direction saying coolly, "He's got this. The Brave players, looking formidable in their deep crimson uniforms, stood at the edge of the dugout watching quietly, still unfamiliar to each other and their capabilities. Danny stood in the batters box, his eyes narrowing to mere slits. The pitcher wound up sending a fastball hurtling towards the outside portion of the plate. Danny drew back his hands coiling like a cobra and released a furious swing. The ball met the thick of the bat and was sent like a rocket over the second baseman’s head into right center field. The players ran furiously, watching as Coach Mike twirled his right arm madly like a windmill gone of its track. 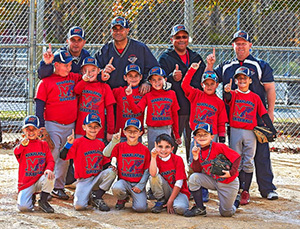 It was a three-run double for the young hero and suddenly the Manalapan Braves were ahead 11-9. CF - Eric J launched a towering home run that plated Christian D, one of the many the runs he'd score during the season, and the Braves never looked back. On the backs of 3B - Matt A and 2B - Nick H, infielders who showed a knack for getting on base throughout the season, the team unleashed a furious 10-run attack taking the opener 21-12. The team all along had immense talent. Suddenly they were bubbling with confidence as well. By month’s end the Braves had run their record to a perfect six wins against no losses. Only one other team in the division enjoyed a similarly perfect record – crosstown rival Marlboro. It was against those Marlboro Mustangs that the Braves found themselves pitted back on October 5th. The Mustangs had just swept a double-header by a combined 21 runs against those same Westfield Blue Devils Manalapan had defeated in the season opener and now led the division with the most runs for and least runs against. This would be Manalapan’s stiffest test to date. The first two frames lived up to the tremendous hype as both teams played ferocious defense, refusing to cede advantage. Ultimately, the Brave’s bats were too mighty for Marlboro to contend with. Four innings later and there would be only one undefeated team in the division. The Braves circled the bases in celebration following the ceremonial handshake. In the weeks that followed the Braves bested the Wolverines of Warren by ten, the Blue Devils of North Edison by 11, and Lincroft by a dozen. Contributions came from up and down the roster. Between Coby D.'s savvy baserunning, the consistent play of Christian Z., and the big bats atop the order, this team had completly gelled. By regular season’s end, this dominating crew had run the table, amassing a perfect 9-0 record and proving to the North division, this was the team to beat. But the playoffs would not come without pressure. So strong was this upstart team from Manalapan, that anything less than a championship might prove difficult to swallow. After winning by forfeit in the opening round, the team faced Lincroft and the result was the mirror image of their regular season contest with the Braves cruising to 18-6 win. The victory earned Manalapan was seemed inevitable since that early season victory against Marlboro – a berth in the championship game. If there was another team in the division who seemed to have destiny on their sides it was Marlboro, owners of 7-1-1 regular season records, and whose sole defeat came against the Manalapan Braves. Having put down all playoff challengers, the Mustangs had earned themselves a rematch against their nemesis, a rematch that would come on September 15. The two powerhouses met in mild weather during the 2nd Sunday in November. It was a sea-saw affair with neither team able to hold the advantage it had gained. By the final pitch, the teams had traded the lead seven times. The Mustangs drew first blood as they jumped out to 1-0 first inning lead, but quickly countered with 3 of their own. RBI singles by Sean C, Anthony C, and and Jake S. put the home team Braves ahead. Danny B, whose big hit in the opener set the tone for the season, singled in both the first and second frames and doubled again the 5th to cap off a perfect 3-3 day. Also knocking in key RBI’s were Christopher L. and Dylan S.
The Mustangs battled, but they couldn’t not put down the powerhouse Braves. Clutch pitching by Anthony C and winner, Dylan S. secured the championship victory for the Braves. In the end it was a stunning season for the first-year team who stormed to a perfect 12-0 while batting a collective .647 on the season while averaging 15 runs per game. Can you say dynasty in the making?